In the above example, you can see an image added to the top left of the post, directly under the headline. The headline is the first place a visitor looks and if they can see a visual clue (the image) that they’re in the right place, they’ll probably continue to read. Choose an image that relates to your post, but it does not have to be a literal interpretation of your post. Use something that makes your readers think and/or evokes some kind of emotion. 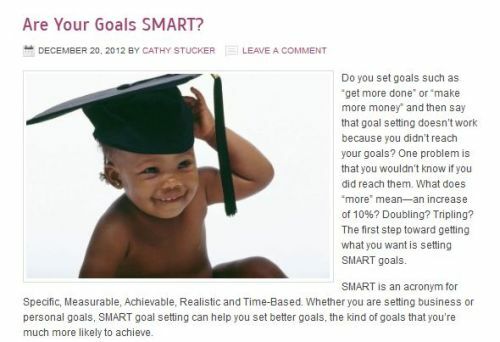 For example, in the post shown above, I am writing about SMART goals. When we think of the word ‘smart’ we may think of education, so showing someone wearing a graduation cap speaks to the ‘smart’ part of the post. Although I could have chosen a photo of someone graduating from college, well, babies are just cuter than adults. ;o) The picture of an adorable baby will get people to look, and then perhaps to read the post. QUICK IMAGE TIP: Readers will tend to look where the person in the photo is looking, so when using a photo of a person position the photo so they are looking toward the content. For example, in the photo above, the baby is looking to the right of the page (from the reader’s perspective). That will send the reader’s eye to the right and directly into the content. The old saying is that “A picture is worth a thousand words.” That is certainly true when you are teaching someone how to do something. You can take screenshots to demonstrate software or how to do something on a website. Photos and drawings can also show readers what to do. You find a lot of how-to images on food sites, where the blogger takes photos of each step in the process so readers can see how to do each step and what the food should look like. Make sure your instructional images clearly show the step you are trying to convey. Images are a great way to clear up any confusion that might come from simply reading instructions. You can edit screenshots and photos to add arrows, circles and text, or otherwise highlight important parts of the illustration. As I said earlier, people like to look at pictures, and pictures will draw them in to your content. You can keep attention with quality writing that is easy to read, but images also can help in this regard. Many people are intimidated by big blocks of text, so use images to break up your post into smaller chunks and make it easier to read. In the example above, images are used to draw the eye in at each section of the article. The content is also nicely laid out with the subheads “Wise Marketing” and “Monetization Plan”, so users can easily scan and absorb the content. Use white space around your images and around blocks of text. You can add text to images to make your content more thought-provoking or motivational. Here’s an example for a post that was used to promote a free downloadable report. Add a Pinterest sharing button and an image like this one is likely to be shared, bringing many more readers to your site. Adding attractive product images can go a long way to gaining your reader’s interest in a product. If you’re using images in content, avoid images with “buy now” or other commercial hype, but choose photos that present the product attractively. To make it easy for customers to buy the product, make the image a clickable link to the sales page for the product, or to add the product directly to their shopping carts. Sometimes the image will be all of the content you need, or you may add just a short couple of sentences of comment about the image. A strong photo or an infographic would be examples. 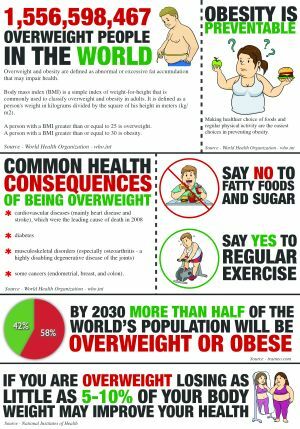 The infographic below is a simple illustration of some facts about being overweight. QUICK IMAGE TIP: Infographics tend to be very large images. You may want to display a reduced-size version of the infographic on your page, and show the full-size image when readers click on the reduced image or a link to the full-size graphic. There are many ways to use images in your content. Try different ways of incorporating images in your posts and see which posts get the most attention and clicks. One way to track is by setting up tests on a service like CrazyEgg.com that will help you create a heatmap of your site and give you some clues about which images are drawing the most attention. The red areas on the heat map are getting more clicks that the other parts of the page. Anything that gets your users more engaged with your content is a good thing, and images will definitely get your users engaged—especially when you use them well. 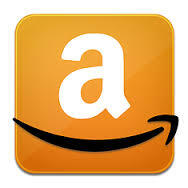 Get $10 in premium image credits free at Kozzi.com when you register using this link. An image placed at the beginning of the post or just below the headline works great. Along with the headline it gives the readers an idea of what they can expect from the post. The images used in this way intrigues the readers and keep them glued. Extremely useful article! I have started working as a content developer and this article has taught me a lot. The suggestions are very helpful and go a long way in making posts interesting. I will try to use your suggestions while developing contents for my blog. I use a lot of infographics in my posts. They are useful to share information effectively. When texts get combined with images, they become stronger and never fail to convey the message. I love lots of pictures, I am very visual 🙂 I think that is also why Pinterest got so popular so quickly – grab everyone’s attention with a good image, then let them read about it! It is also a fun way to browse for interesting content. I enjoy infographics, but have not yet started using them on my blogs too much. I am not a graphic designer, so have not yet come up with a good design to put into an infographic. Ruth Martin recently posted…Learn How to Play Keyboard in 30 Days or Less!